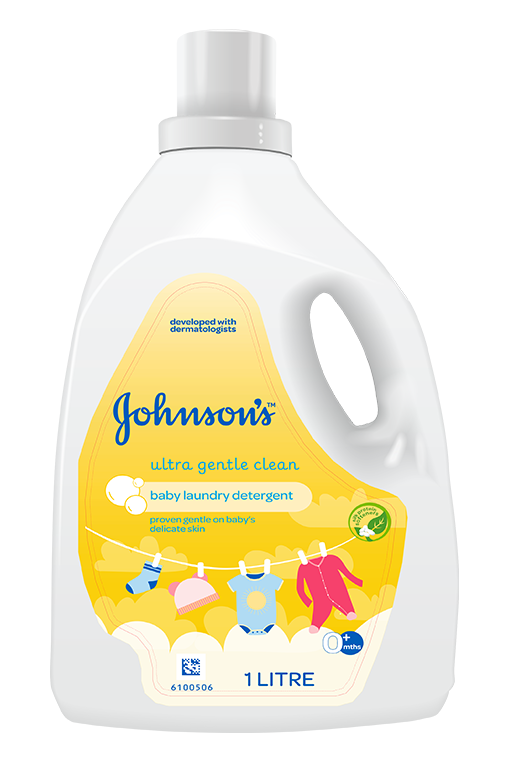 This JOHNSON'S® baby product is designed to ensure gentle cleaning of your little one’s delicate clothes. We at JOHNSON'S® know that you need to protect your baby from everything harsh. Hence you go that extra mile to ensure that only the most gentle care reaches her. Which is why, when it comes to her clothes, you soak them seperately, disinfect & rinse thoroughly! But, did you know that disinfectants & regular-use detergents could be adding more harshness than what is being rinsed away? To make sure your little one gets only the most gentle care, a detergent for baby clothes, that understands your child’s sestitive needs is just what a loving mother wants. A detergent for babies knows the importance of clean clothes for your little one and also the value of protecting her delicate skin form any external roughness! Available in 1L bottle and 500ml refill. *Dilute 5ml of JOHNSON'S® Ultra Gentle Clean Baby Laundry Detergent in 5 lts. of water. *Add soiled clothes and soak. *After hand-washing, rinse completely with clean water. *Add approximately half a bottle cap (30 ml) of JOHNSON'S® Ultra Gentle Clean Baby Laundry Detergent into the washing machine. *Put all the soiled clothes in the washing machine. *Follow the standard washing machine procedures. This baby laundry detergent contains silk proteins for softer baby clothes. Water, PEG-80 sorbitan laurate, cocamidopropyl betaine, sodium trideceth sulfate, PED-150 distearate, citric acid, phenoxyethanol, sodium hydroxide, glycerin, sodium benzoate, tetrasodium EDTA, fragrance, polyquaternium-10, ethylhexylglycerin. Keep out of reach of children. If product gets into eyes immediately wash with water or go to hospital.